Last week, the City of Atlanta announced that the first phase of the Atlanta BeltLine's keystone project – a 400-foot deep former granite quarry proposed as a new reservoir and public greenspace – will open to the public in 2019. The Atlanta Beltline is a ring of former railways around the southern capital that is being redeveloped into a 22-mile ribbon of parkway that will eventually connect 45 neighborhoods. It is the single largest economic development project the city has ever undertaken. The Bellwood Quarry itself is an impressive site at a monumental scale, and has been featured in shows and movies like The Walking Dead, Stranger Things, and The Hunger Games. The re-use of the quarry and parkland surrounding it, spanning 280 acres, is no small task. In partnership with the BeltLine, the Department of Watershed Management has drained the mineral pit of its standing water and is now boring a massive mile-long tunnel connecting it to the Chattahoochee River, with the end goal of providing Atlanta with 30 days of reservoir water rather than its current 5-day supply. Although the quarry is closed to the public for construction, it seems to be proceeding at a clip, and this announcement may be a hint that the process is being expedited in line with the end of Atlanta Mayor Kasim Reed's term in November. After all, the quarry is a highly-anticipated legacy project. The RFP for design proposals for the park surrounding the reservoir closed yesterday after opening in late July. According to an anonymous source close to the project, the first phase of the Westside Reservoir Park will likely be a smaller prototype park on a small fraction of the total property, meant to garner public enthusiasm and draw investment while the larger reservoir project undergoes construction. Whether this pocket park will be completed by 2019 is a matter of skepticism within the organization, according to AN's source. One factor complicating matters is a recent shakedown in leadership: Paul Morris, the former CEO of Atlanta BeltLine, Inc., stepped down three weeks ago after a heated public controversy surrounding the organization's shaky commitment to affordable housing in new development around the park. However, Morris' replacement, Brian McGowan, brings a hefty amount of experience in civic and economic development to the seat, having formerly served as the Executive Vice President of the Metro Atlanta Chamber, CEO of Invest Atlanta, and is now leaving a position as a Principal at international law firm Dentons. 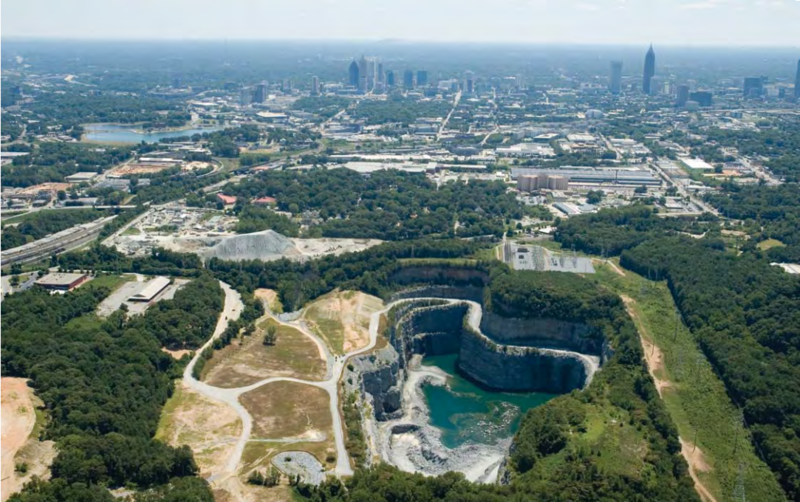 Whether the first chapter of Bellwood Quarry's extensive refurbishment will be open to the public by 2019 or not, the BeltLine and its partners have, at least for the time being, redirected public attention away from what's sure to be a long and drawn-out debate about what the BeltLine – with all its ecological, recreational, and economic benefits – will mean for surrounding neighborhoods in the long term. This is not a question limited to the BeltLine. Hopefully the project will spur lawmakers to push for more affordable housing than is currently proposed by ABI, which now works in tandem with the Atlanta Housing Authority. For the scale of the project – which circles the entirety of Metro Atlanta with a population of 5.7 million – 5,600 affordable units seems like a low bar. The City of Atlanta has announced a competition for the design of an outdoor cultural pavilion for prominent display on the Westside trail of the Atlanta BeltLine. The BeltLine is the most comprehensive transportation and economic development ever undertaken by the City of Atlanta, and among the largest urban redevelopment programs in the US, providing affordable workforce housing, brownfield remediation, public art, and historic preservation. The National Pavilion Design Competition seeks designs for the second pavilion in a series of small, multi-purpose artistic pavilions occupying green spaces along the BeltLine as part of the Art on the Atlanta BeltLine program, which represents the South’s largest outdoor temporary art exhibition. The culture-conscious platform engages hundreds of artists to display visual and performing arts in the parks and along the trails of the BeltLine. The pavilion’s prospective location at the intersection of the Westside trail and Allene Avenue poises it to become an iconic landmark for the Adair Park community and its surrounding historic neighborhood. In the spirit of fostering community gathering, the Atlanta BeltLine is also seeking designs for a permanent performance space at Adair Park. Design-wise, the facility should represent the quality art and architecture which the BeltLine strives to embody. The competition is seen to straddle the fields of art, architecture, landscape architecture, and the pedestrian experience, as well as provide a catalyst for economic development. “This competition demonstrates that small yet exceptional design can offer huge benefits for Atlanta communities,” said Melody Harclerode, President of AIA Atlanta and manager of the National Pavilion Design Competition. The only eligibility requirement is that an individual or team member be a licensed architect holding active AIA membership. The first place winner stands to receive a $10,000 cash prize, while a $5,000 and $3,000 prize are up for grabs for the second and third place winners respectively. The competition represents a partnership between AIA Atlanta, Atlanta BeltLine Inc., and the City of Atlanta Mayor’s Office of Cultural Affairs.